Constant improvement of key performance indicators that are related to quality is a step in the right direction for a company interested in market growth. There are available tool to lend a fresh look to quality procedures. ConceptDraw MINDMAP has a new addition for the ConceptDraw Solution Park that provides a creative approach to visualizing quality processes, Quality Mind Map Solution. Pic.1 Six sigma - Quality mind map. 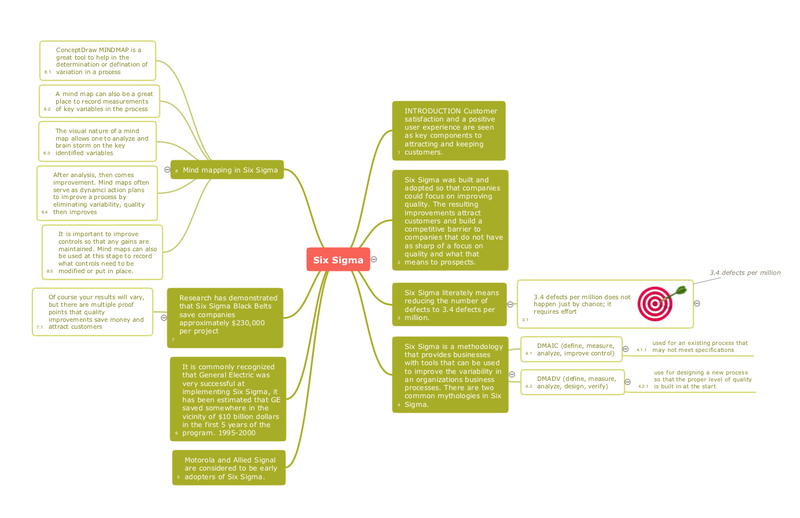 You can mindmap your own quality issues for constant improvement of key performance indicators. Successful quality management implemented in a company of any size is a critical component of a company organization. Visualizing sales data help you see the facts and KPIs about your sales process to make conclusions and see how your business can improve.